The Ion Age Blog: IMP43 Female Muster Banner Bearer free for all March 2017! IMP43 Female Muster Banner Bearer free for all March 2017! 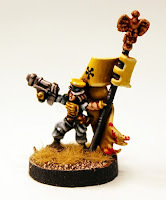 What a mad short month February was as most of my attention was taken up with the merger of 15mmcouk back into Alternative Armies and with getting a concept article on the coming Shia Khan book out on the blog plus a whole Legion Pioneer Ordos. Wow! All in twenty eight short feeling days. Now we are in March and it will be an exciting month for IonFans with several new Khanate 15mm releases plus preview page of the coming book and ending with details of when the book will be out to be in your hands. All of this to come. Now onto the news for the start of the month. A new free monthly and a special ones at that. 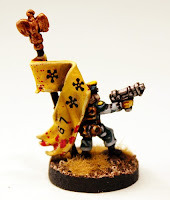 A banner bearer free in every order placed automatically. The Ion Age is all about space opera adventure and warfare in the far future and to that end it assumes not only the use of powered armour and powered swords but also of concepts such as valour and heroic nature. In Patrol Angis this concept is carried into the game on the tabletop with an Advanced Rule on page 38 called 'Valour' where the sight of a banner waving in the breeze of battle inspires troops all the more. All of our command packs of miniatures have a banner bearer in them and these are considered core poses. 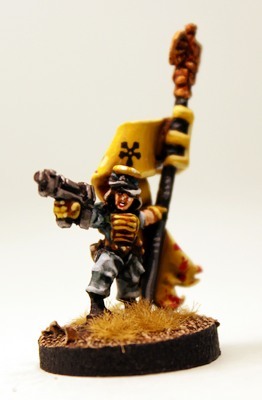 This month we present IMP43 Female Muster Banner Bearer who fits right in with your Muster or Patrol or even Planetary Militia platoons in play. We welcome the 43rd free monthly 15mm miniature and month of our little space opera setting. Free in every order every time all month before being retired. This miniature is automatically put into every order at the rate of one per order regardless of order value. It can also be bought in any amount on the monthly IMP page of the website for this month only too before being withdrawn on the first of next month. We are into Year Four now and if you missed it you can see the Year Three Collection on the website. Standing 17mm to the eye line the Female Muster Banner Bearer is fitting for any platoon and is wearing standard Aketon Armour and holding a Tumbler SMG. Her banner is sculpted to the figure meaning all you need to do is choose the design to go upon it. It is a superbly impressive 15mm scale figure. 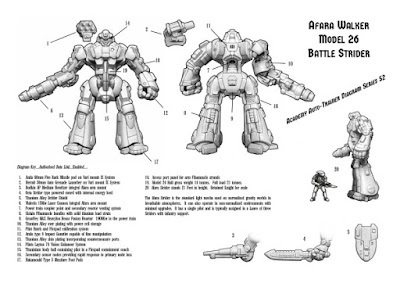 There is a growing page on the Ion Age website where the current and all former IMP series free miniatures are shown so that you can see what came before. Enjoy looking at what came before. This miniature is worth 0.60GBP. Lastly we have a new month long special offer...it is a bloody good one....25% off all three variants of the IAF128 Afara Strider our resin light mecha which is 55mm tall. We will have a fun article later this month with an Afara in the service of the League of Canlaster taken from our own gaming collection. The Afara is generic enough for many settings and it is designed for tabletop gaming being easy to assemble from few parts and durable to use in play too. I am also told it can be easily converted and altered with parts from our other codes such as IAF065 Vehicle Conversion Kit. The discount is online and all you need do is add to cart, reward points are as normal and can be used on this offer too. Offer ends 1st April. Click on the links to learn more. As always if you are reading this bulletin later in the month or further into the future please do have a look at our blog and use it as a time machine to read all the excellent content that is there going right back to our start. Try August 2016 for instance where you can find a parts article on the Afara plus civilian pack releases and our Uniforms of Prydia poster too.